Posted on August 11, 2017 at 10:53 pm. This week, I had the honor of joining teams from Spokane, Pierce, and King counties to celebrate the conclusion of the 100-Day Challenges – a collaborative effort to connect youth and young adults with stable housing over a period of 100 days. We launched these Challenges in April because we knew that it was an important moment in time – Washington state was paying attention to youth homelessness in a way it never had before. We wanted to channel this momentum and rethink how we support young people who are struggling. On August 9th and 10th, teams met in Spokane for the Sustainability Review, an opportunity to mark the end of the Challenges and look ahead beyond Day 101 – ensuring the good work that was done will continue to deliver real results for Washington’s youth. I am so proud of the dedication and courage that the 100-Day team members displayed, and the remarkable local leadership that supported the teams’ work in each region. Altogether, teams housed 615 young people across the three communities. In Spokane, 109 youth and young adults were connected to housing, with a focus on those who face substantial barriers. 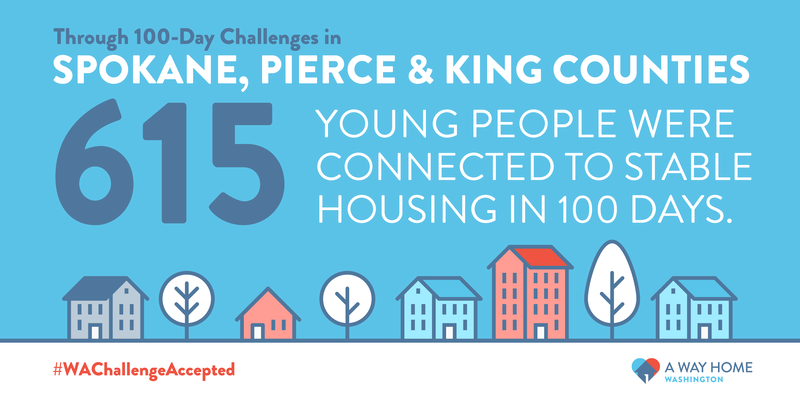 In Pierce County, 176 youth and young adults found housing options, many who are disproportionately affected by homelessness, including young people of color and those who identify as LGBTQ+. In King County, 330 youth and young adults were aided in finding housing – the most in any Challenge to date across the country. Seventy-six percent of those housed were young people of color and/or identify as LGBTQ+. You can find more information and dashboards charting the teams’ progress throughout the 100 days on our website. These data-rich dashboards allowed each team to track progress toward the milestones they set for their region. When the teams came together to launch the Challenges in April, they intentionally set ambitious goals for how many youth and young adults they could house in 100 days. And they accomplished so much – forever changing the lives of 615 young people in Washington. But beyond the numbers, the core of the Challenges was the tremendous willpower and collaboration of these mission-driven and talented teams. Teams from each of the three communities included young professionals who will become the next generation of system leaders. All three teams brought in the ideas and perspectives of young adults who have experienced homelessness. Each community experimented with new practices or changing policies and practices to remove barriers. Pierce County nonprofits, for example, provided phones to young people so they could be alerted when a bed became available, while also providing a stable mechanism for communication. Communities focused on reaching, engaging, and supporting young people who face some of the hardest barriers, including youth of color and LGBTQ+ (lesbian, gay, bisexual, transgender, queer/questioning) youth – and they made great progress against this objective. The teams’ work transformed lives and will go far in learning how to improve systems and processes so that all young people can find their way home. I spoke with a young woman from King County who had previously found housing, but it was not the best fit, and she was worried about ending up homeless. She engaged with a local Host Home program and was connected with a safe, stable home. In Pierce County, a young man who had been suffering from addiction and mental health issues was aided by peer outreach workers who helped him find safe housing and begin his path to recovery. In Spokane, a young woman was connected to permanent and stable housing after spending much of her life cycling through foster homes and dealing with the effects of verbal and physical abuse (the Spokesman-Review chronicled her story in a recent article). These stories are only a small sample of the deep and meaningful affect teams had on their communities throughout the Challenges. In addition to the people and organizations that made up the three teams, these Challenges wouldn’t have been possible without the Rapid Results Institute, who provided coaching and mentorship, and the Raikes Foundation and Schultz Family Foundation, which offered financial support. I can’t thank them enough for believing in our teams and our mission and for being such fierce champions over these 100 days. Beyond the hundreds of young people who were housed over these 100 days, lessons learned and insight gained during the Challenges will inform the path forward to ensure every young person has a safe and stable place to call home. A Way Home Washington will be sharing more detailed analysis and findings from the 100-Day Challenges later this fall. Together, we CAN prevent and end youth and young adult homelessness in Washington state – and these 100 days proved progress is real and happening across this great state. Let’s continue the momentum so all of Washington’s young people can find their way home.